Express your thoughts with personalized rubber bracelets. They can be made with any inscription you can imagine and are a great way to get the message out about a worthy cause or to honor someone special. Rubber awareness bracelets are a hot item that can be seen just about anywhere. Many people wear one to show their support of a specific cause or belief. Two popular versions are the yellow Lance Armstrong "Live Strong" bracelet and the soft pink breast cancer awareness bracelet. 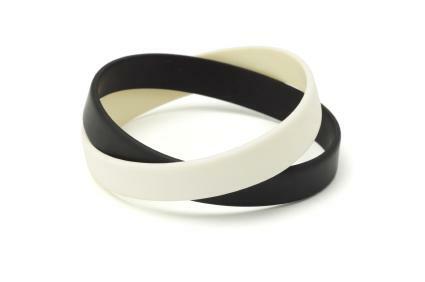 These types of rubber bracelets are pre-made and sold at various locations. They convey a simple message and can be worn by anyone who believes in the cause that they are endorsing. Rubber bracelets continue to be a popular accessory and have become a trend that is probably not going away anytime soon. In fact, this inspirational style item is only becoming more popular, since there is an option to create your own bracelet to convey any message you choose. Birthday parties: Have bracelets made with the guest of honor's name and birthday. Fundraising: Raise money for a worthy cause by selling bracelets with your organization's name and logo on them. Family reunions: Create bracelets with your family's name and the reunion date. Memorial events: Honor a loved one who has passed by having this person's name displayed on the bracelet. School spirit week: Raise school spirit by creating a bracelet in your school's color. Business events: Personalized bracelets can be used to promote a business. There are numerous sites online that give you the option to personalize rubber bracelets. Many sites require that you purchase bracelets in bulk, so you may want to keep an eye out for sites with no minimum order. Messages can be embossed, debossed, ink injected, color-coated, or printed. You can either upload your own custom artwork or choose from the selection of fonts and graphics found on the site. With all the colors, printing styles, and custom graphics and messages available, it's easy to create a rubber bracelet that is perfect for your cause or event. Use your imagination to find the unique combination of options that fits your personal style.